M-28 is an east–west state trunkline highway that traverses nearly all of the Upper Peninsula of the U.S. state of Michigan, from Wakefield to near Sault Ste. Marie in Bruce Township. Along with US Highway 2 (US 2), M-28 forms a pair of primary highways linking the Upper Peninsula from end to end, providing a major access route for traffic from Michigan and Canada along the southern shore of Lake Superior. M-28 is the longest state trunkline in Michigan numbered with the "M-" prefix at 290.373 miles (467.310 km). The entire highway is listed on the National Highway System, while three sections of M-28 are part of the Lake Superior Circle Tour. M-28 also carries two memorial highway designations along its route. Throughout its course across the Upper Peninsula, M-28 passes through forested woodlands, bog swamps, urbanized areas, and along the Lake Superior shoreline. Sections of roadway cross the Ottawa National Forest and both units of the Hiawatha National Forest. Some of the other landmarks accessible from M-28 include the Seney Stretch, Seney National Wildlife Refuge and several historic bridges. M-28 is an original trunkline designation, dating to the 1919 formation of the state's trunkline system. The original highway was much shorter than the current version. M-28 was expanded eastward to the Sault Ste. Marie area in the late 1920s. The western end has been expanded twice to different locations on the Wisconsin state line. Other changes along the routing have led to the creation of three different business loops at various times, with one still extant. Future changes, proposed by Marquette County but not accepted by the Michigan Department of Transportation (MDOT), could see M-28 rerouted over County Road 480 (CR 480). M-28 is a major highway for Michigan and Canadian traffic along the south shore of Lake Superior. It forms the northern half of a pair of primary trunklines linking the Upper Peninsula from end to end; US 2 is the southern partner. The 290.373-mile (467.310 km) highway comprises mostly two lanes, undivided except for sections that are concurrent with US 41 near Marquette. The "Marquette Bypass" portion of US 41/M-28 is a four-lane expressway, and segments of the highway in Marquette County have four lanes. The entire route is part of the National Highway System, and three sections of the trunkline are part of the Lake Superior Circle Tour. In the west, M-28 begins at a signalized intersection with US 2 in Wakefield. Heading north, the highway passes Sunday Lake heading out of town. After crossing into southwestern Ontonagon County and the Eastern Time Zone, the trunkline highway skirts the northern shore of Lake Gogebic, running concurrently with M-64. The first section of M-28 designated as a part of the Lake Superior Circle Tour is from the western terminus to the eastern junction with M-64 in Bergland, where the Circle Tour turns north along M-64, leaving M-28. Here, M-28 has its lowest traffic counts; within the 2013 MDOT survey, the road is listed with only an average annual daily traffic (AADT) of 1,425 vehicles on a section of highway between Bergland and the US 45 intersection in Bruce Crossing. The trunkline runs through heavily forested areas of southern Houghton and Baraga counties. At the eastern junction with US 41 near Covington, M-28 receives the Circle Tour designation again and exits the Ottawa National Forest. In Baraga and Marquette counties, US 41/M-28 passes through hilly terrain before entering the urban areas of Ishpeming, Negaunee and Marquette. Approximately 13,000–17,000 vehicles use this section from Ishpeming eastward through Negaunee. West of the city of Marquette, US 41/M-28 had a peak 2013 AADT of 32,805 vehicles in Marquette Township along a retail and business corridor. This peak level is sustained until the start of the Marquette Bypass, where the traffic returns to the 16,500-vehicle and higher levels seen in Ishpeming and Negaunee. South of the city of Marquette, traffic counts once again climb to 19,620 vehicles. In Chocolay Township the AADT drops to 8,840 vehicles before tapering off to 3,065 vehicles by the county line. At the Ishpeming–Negaunee city line, M-28 changes memorial highway designations. From the western terminus to this point, M-28 is called the "Veterans Memorial Highway", but it becomes the "D. J. Jacobetti Memorial Highway" to honor the longest-serving member of the Michigan Legislature, Dominic J. Jacobetti. The Jacobetti Highway designation ends at the eastern M-123 junction in Chippewa County. Between Marquette and Munising, M-28 closely parallels the Lake Superior shoreline, providing scenic views of the lake and its "lonesome sandy beaches". The Lakenenland Sculpture Park is located in Chocolay Township near Shot Point in eastern Marquette County. This roadside attraction is owned by Tom Lakenen and features fanciful works of art made of scrap iron. Near the community of Au Train, M-28 crosses into the western unit of the Hiawatha National Forest. West of Munising is a ferry dock offering transport to the Grand Island National Recreation Area, and at Munising there is easy access to Pictured Rocks National Lakeshore. The roadway also features variable-message signs to warn motorists of winter weather-related traffic closures along the lakeshore. Installed at the US 41 and M-94 junctions, the signs advise motorists which sections of roadway are closed. Per MDOT policy, only snowplows are allowed on these sections during a closure. The highway exits the Hiawatha National Forest at the Alger County–Schoolcraft County line along the Seney Stretch. The portion of M-28 between Seney and Shingleton, called the Seney Stretch, is 25 miles (40 km) of "straight-as-an-arrow highway" across the Great Manistique Swamp, "though others claim it's 50 miles [80 km], only because it seems longer." The Seney Stretch is the longest such section of highway in the state, and "one of the longest stretches of curveless highway east of the Mississippi." The highway is often cited as the "state's most boring route" according to the Michigan Economic Development Corporation (MEDC) and Hunts' Guide. The straightness and flatness over a great distance are given as reasons for the reputation of this stretch as boring. The road across the swamp was constructed parallel to the line of the Duluth, South Shore and Atlantic Railway (later the Soo Line Railroad). It was first numbered as a part of M-25 when that designation was used along today's M-28 east of US 41. The most significant changes made to the stretch since its original construction were the addition of passing relief lanes and a full-scale, year-round rest area in 1999. Part of the Seney Stretch forms the northern border of the Seney National Wildlife Refuge. Established in 1935, this refuge is a managed wetland in Schoolcraft County. It has an area of 95,212 acres (385 km2), and contains the Strangmoor Bog National Natural Landmark within its boundaries. Past Seney, M-28 once again enters woodlands on the eastern end of the Upper Peninsula. In Luce County, the roadway passes through the community of McMillan en route to Newberry. The Circle Tour departs M-28 to follow M-123 at Newberry, looping north to the Tahquamenon Falls State Park. East of town, the road passes Luce County Airport off of Luce CR 399. From there, M-28 crosses the east and west branches of the Sage River and passes south of Soo Junction, before the Chippewa County border. In Chippewa County, M-28 begins bending slightly east-northeastward. Hulbert Lake is located south of Hulbert; north of the lake, the highway enters the eastern unit of the Hiawatha National Forest. At the eastern junction of M-28 and M-123 near Eckerman and Strongs, the Circle Tour returns to M-28 and the D.J. Jacobetti Memorial Highway designation ends. The highway leaves the eastern unit of the Hiawatha National Forest between the communities of Raco and Brimley. M-221 leads north from the main highway on an old routing of M-28 to connect to the community of Brimley and the Bay Mills Indian Community. Brimley State Park is just east of Brimley on the old 6 Mile Road alignment of M-28. The highway meets I-75 at exit 386, and the Lake Superior Circle Tour departs M-28 to follow I-75. This interchange is just west of H-63/Mackinac Trail, a former segment of US 2. M-28 continues three miles (4.8 km) farther to its eastern terminus with M-129. Along the routing of M-28, MDOT has established several roadside parks and rest areas. Two of these are in Ontonagon County near Ewen and Trout Creek. A park with a picnic area and a footbridge lies near Tioga Creek in Baraga County east of the US 41 junction. In Michigamme a scenic turnout and a roadside park overlook Lake Michigamme, and along Lake Superior south of Marquette is a tourist information center built as a log cabin. East of the H-01 junction in Au Train is a roadside park that includes Scott Falls. Further east, a year-round rest area is located on the western end of the Seney Stretch. Three other roadside parks lie east of Harvey in Shelter Bay, on the shores of Deer Lake and west of Newberry. Formed by July 1, 1919, M-28 began in Wakefield at a junction with then M-12 and ran roughly along the current alignment to end at M-15, 6.5 miles (10.5 km) east of Covington. These two termini roughly correspond to the modern US 2 and western US 41 junctions respectively. M-28 was extended in 1927 along US 41 into Marquette County and east over M-25 through Chatham, Munising, and Newberry, before ending in downtown Sault Ste. Marie. At Negaunee, M-28 took the former routing of M-15 between Negaunee and Marquette for 10 miles (16 km) while US 41 ran along a portion of M-35. This southern loop routing of M-28 lasted until approximately 1936, when M-28 was moved to US 41, and the former route became CR 492. A new routing of M-28 in the Newberry area opened later that year, and a new M-28A (later Bus. M-28) existed until 1953. Another realignment in 1937 marked the transfer of M-28 out of downtown Ishpeming and Negaunee. This former routing later became Bus. M-28. In the late 1930s, a highway numbered M-178 was designated between M-28 south of Munising to M-94 in town. In 1941, the routings of M-28 and M-94 were reversed between Harvey and Munising, and M-28 supplanted the M-178 designation completely. Since then, M-28 has run along the lakeshore through Au Train. M-28 was extended along US 2 to the state line at Ironwood, and the eastern end of M-28 through Brimley was moved to a new alignment ending at US 2, in Dafter in 1942. The eastern end was moved along US 2 back to Sault Ste. Marie in 1948, though the terminus was returned to Dafter in 1950. From 1952 to 1962, M-28 crossed US 2 at Wakefield going south and stopped at the Wisconsin border, connecting with a county road. This segment of the highway (now Gogebic CR 519) was transferred back to the county in 1962. M-94 previously looped along Munising-Van Meer-Shingleton Road (now H-58 and H-15) north of M-28 between Munising and Shingleton. This routing was abandoned on November 7, 1963 in favor of the current concurrency. The last significant change to the M-28 routing occurred on March 3, 1989, when the eastern terminus was moved east to M-129. MDOT unveiled plans on March 31, 2009, to rebuild the intersection between Front Street and the eastern end of the Marquette Bypass during 2010. The previous intersection configuration dated back to the 1960s and had been labeled as "dangerous and [causing] significant traffic delays" by the designers of the replacement. A traffic study concluded in 2007 that the intersection would need either the roundabout or a traffic signal with several turning lanes to accommodate the traffic needs in the area. MDOT decided in favor of a two-lane, 150-foot (46 m) roundabout retaining the right-turn lanes from the previous intersection layout. These lanes will be used by right-turning traffic to bypass the circle at the center of the intersection. Construction started on the project in May. A section of the intersection was opened in July to traffic from the south that turns west. The lanes northbound into downtown were opened in the beginning of August, and the city held a ribbon cutting ceremony on August 19, 2010. The remaining lanes were opened the next day. MDOT has highlighted five historic bridges along the route of M-28 on the MDOT website. In Interior Township, Ontonagon County, the highway crosses the Ontonagon River over a bridge built in 1929. Designed by the State Highway Department and built by the firm of Meads and Anderson, the Ontonagon River Bridge is one of only three steel arch bridges in Michigan. The main span arch is 150 feet (46 m) long. A former routing of M-28 in Covington Township crosses the Rock River. Although this section was bypassed by a new alignment of the trunkline in 1924, the bridge remains complete "with corbeled bulkheads and six panels recessed in the concrete spandrel walls." The corbels and spandrels are decorative features found in the concrete sides of the bridge. Today, drivers cannot use the Peshekee River Bridge south of US 41/M-28 in western Marquette County's Michigamme Township. The bridge was listed on the National Register of Historic Places in 1999 as "Trunk Line Bridge No. 1" for its engineering and architectural significance. MDOT has listed it as "one of Michigan's most important vehicular bridges." It was the first bridge designed by the Michigan State Highway Department, the forerunner to MDOT, in 1914. It was bypassed by a newer bridge built over the Peshekee River on US 41/M-28 subsequently abandoned as a roadway. The replacement bridge was bypassed and demolished in 1995. The next historic bridge listed by MDOT along M-28 is over the Sand River in Onota Township in Alger County. While not visible to motorists, the bridge, constructed in 1939, is the longest rural rigid-frame span in Michigan. Most bridges of this type were built in urban locations, and soil conditions in the state limit locations for this style of bridge. The bridge over the East Branch of the Tahquamenon River in Chippewa County was built in 1926 as a "formative exercise in what would evolve into a state standard design." The 55-foot (17 m) bridge was built with nine lines of I-beams encased in concrete. Only one other bridge in Michigan was built with such concrete encasement. In the August 24, 2005 edition, the Marquette Mining Journal reported that the Marquette County Board and the County Road Commission were negotiating with MDOT to transfer the jurisdiction of Marquette County Road 480 to the state. Several routing options have been discussed, though all would make CR 480 a part of M-28. Cost was the primary reason given behind rerouting M-28 along CR 480. "The road commission receives about $50,000[a] a year in state gas tax money but spends about $100,000[b] to maintain CR 480 because of the type and volume of traffic it receives." Handing CR 480 over to the state would shift the maintenance costs to the state, as well. MDOT has indicated that it has not requested jurisdiction, but rather if it assumed control of the route, the community would need to support a through-route. Several proposals have arisen, including creating a "spur" from US 41/M-28 through the east end of Ishpeming to meet CR 480 west of Negaunee. This spur would pass through recently reopened former mining "caving grounds", and to the south of the Mather A & B Mine complex. According to Gerry Corkin, Marquette County Board Chairman, "the land that was purchased by Ishpeming and Negaunee, the mining company land, this has the potential to help in the development of that if this is compatible. I think both cities will be interested in taking a look at what the land uses are and where this [spur] would push through." The spur proposal would open land to development between the downtown areas of the two cities. If jurisdiction is transferred, and M-28 is routed over CR 480 as proposed, M-28 would leave the concurrency with US 41 near Teal Lake in Negaunee, and cross the caving grounds west of downtown to connect to Rail Street. Rail Street would serve as the connector to CR 480, which ends at the intersection of Rail and Ann streets and Healey Avenue. Proposals indicate two routing options for the east end of CR 480. One would route M-28 back along US 41 from Beaver Grove north of the CR 480 eastern terminus to the existing M-28 in Harvey. A second would route it along CR 551/Cherry Creek Road from CR 480 to M-28 in Harvey. There have been three business loops for M-28: Ishpeming–Negaunee, Marquette and Newberry. Only the business loop serving Ishpeming and Negaunee is still a state-maintained trunkline. US 41/M-28 was relocated to bypass the two cities' downtowns in 1937. The highway through downtown Ishpeming and Negaunee later carried the ALT US 41/ALT M-28 designation before being designated Bus. M-28 in 1958. The western end of the business loop was transferred to local government control when Bus. M-28 was moved along Lakeshore Drive in 1999. Bus. US 41 in Marquette was first shown on a map in 1964 after the construction of the Marquette Bypass. It was later designated Bus. US 41/Bus. M-28 on a map in 1975; this second designation was removed from maps by 1982. The entire business loop was turned back to local control in a "route swap" between the City of Marquette and MDOT announced in early 2005. The proposal transferred jurisdiction on the unsigned M-554 and the business route from the state to the city. The state would take jurisdiction over a segment of McClellan Avenue to be used to extend M-553 to US 41/M-28. In addition, MDOT would pay $2.5 million (equivalent to $3.16 million in 2018) for reconstruction work planned for 2007. The transfer would increase Marquette's operational and maintenance liability expenses by $26,000 (equivalent to $33,000 in 2018) and place the financial burden of the future replacement of a stop light on the city. On October 10, 2005, MDOT and Marquette transferred jurisdiction over the three roadways. As a result, Bus. US 41 was decommissioned when the local government took control over Washington and Front streets. As a result of the decommissioning, the 2006 maps did not show the now former business loop. The Newberry Bus. M-28 was designated from 1936 until 1952 as M-28A. The MSHD maps of the time showed it signed as Bus. M-28 in 1952 before it was turned back to local control in 1953. ^ Equivalent to $63,000 in 2018. ^ Equivalent to $126,000 in 2018. ^ a b Michigan State Highway Department (July 1, 1919). State of Michigan (Map). Scale not given. Lansing: Michigan State Highway Department. Upper Peninsula sheet. OCLC 15607244. Retrieved December 18, 2016 – via Michigan State University Libraries. ^ a b c Michigan Department of Transportation & Michigan Center for Shared Solutions and Technology Partnerships (2009). MDOT Physical Reference Finder Application (Map). Michigan Department of Transportation. Retrieved April 13, 2010. ^ a b Michigan Department of Transportation (April 28, 2004). "Chapter One: Introduction" (PDF). US 41/M-28 Access Management Plan. Michigan Department of Transportation. Archived from the original (PDF) on December 23, 2007. Retrieved January 18, 2008. ^ a b c d e f g Michigan Department of Transportation (2014). Pure Michigan: State Transportation Map (Map). c. 1:975,000. Lansing: Michigan Department of Transportation. §§ C1–C11. OCLC 42778335, 900162490. ^ Michigan Department of Transportation (April 23, 2006). National Highway System, Michigan (PDF) (Map). Scale not given. Lansing: Michigan Department of Transportation. Archived from the original (PDF) on September 21, 2012. Retrieved February 4, 2008. ^ a b Bureau of Transportation Planning (2008). "Traffic Monitoring Information System". Michigan Department of Transportation. Retrieved December 19, 2014. ^ a b c d e Rand McNally (2013). "Michigan" (Map). The Road Atlas (2013 Walmart ed.). 1:1,267,200 and 1:1900,800. Chicago: Rand McNally. pp. 50–51. §§ C10–C14, D1–D9. ISBN 0-528-00626-6. OCLC 773666955. ^ Barnett, LeRoy (2004). A Drive Down Memory Lane: The Named State and Federal Highways of Michigan. Allegan Forest, MI: Priscilla Press. pp. 115–16, 226. ISBN 1-886167-24-9. OCLC 57425393. ^ Prusi, Renee (November 28, 1994). "End of an Era: Jacobetti Dies This Morning". The Mining Journal. Marquette, MI. pp. 1A, 5A. ISSN 0898-4964. OCLC 9729223. ^ Michigan Legislature (October 26, 2001). "Michigan Memorial Highway Act (PA 142 of 2001)". Retrieved June 6, 2008. ^ Hunt, Mary & Hunt, Don (2007). "Munising—Pictured Rocks National Lakeshore". Hunts' Guide to Michigan's Upper Peninsula. Albion, MI: Midwestern Guides. Retrieved July 22, 2008. ^ Fowler, Brenda (June 29, 1997). "Endless Trails To Open Water". The New York Times. ISSN 0362-4331. OCLC 1645522. Retrieved February 20, 2008. ^ Hunt & Hunt (2007), "Lakenenland". ^ Garner, Dawn (November 23, 2005). "MDOT and MSP Prepare for Bad Weather on M-28" (Press release). Michigan Department of Transportation. Archived from the original on December 24, 2007. Retrieved January 19, 2008. ^ Google (September 15, 2006). "Overview Map of the Seney Stretch" (Map). Google Maps. Google. Retrieved September 15, 2006. ^ * Dennis, Jerry (June 1998). The River Home: An Angler's Explorations (1st ed.). New York: St Martin's Press. n.p. ISBN 0-312-18594-4. OCLC 38438636. ^ Spalding, Steve (August 26, 2006). "You Haven't Lived Here Until... You've Driven the Seney Stretch". Detroit Free Press. p. 4A. ISSN 1055-2758. OCLC 10345127, 137343179. ^ * Carter, James L. (2004). A Historical Guide to the Seney Stretch. Marquette, MI. : Pilot Press. p. 1. OCLC 57178325. ^ Michigan Economic Development Corporation (2006). "Michigan Fall Color Tours: Munising, Newberry, Grand Marais". Pure Michigan Travel. Michigan Economic Development Corporation. Archived from the original on December 21, 2006. Retrieved July 22, 2008. ^ a b Hunt & Hunt (2007), "Shingleton". ^ Shreck, Bill (May 28, 1999). "New Seney Rest Area Brings Year 'Round Relief to M-28 in the Upper Peninsula" (Press release). Michigan Department of Transportation. Archived from the original on March 15, 2007. Retrieved September 15, 2006. ^ United States Fish and Wildlife Service (August 15, 2007). "Visitor Information". Seney National Wildlife Refuge. United States Fish and Wildlife Service. Archived from the original on May 22, 2008. Retrieved July 22, 2008. ^ Rosentreter, Roger L. (May – June 1986). "Roosevelt's Tree Army: Michigan's Civilian Conservation Corps". Michigan History. Lansing: Michigan Department of State. ISSN 0026-2196. OCLC 1757361. Archived from the original on November 1, 2007. Retrieved December 3, 2007. ^ United States Fish and Wildlife Service (August 17, 2007). "Fact Sheet". Seney National Wildlife Refuge. United States Fish and Wildlife Service. Archived from the original on February 29, 2008. Retrieved March 18, 2008. ^ United States Fish and Wildlife Service (February 3, 2011). "About Us". Seney National Wildlife Refuge. United States Fish and Wildlife Service. Archived from the original on March 20, 2011. Retrieved February 23, 2011. ^ Michigan Department of Natural Resources. "Brimley State Park Detail". Michigan Department of Natural Resources. Retrieved March 18, 2008. ^ Hunt & Hunt (2007), "Tioga River Roadside Park and Waterfall". ^ Hunt & Hunt (2007), "Au Train—Scott Falls, The Face in the Rock, MDOT Harold Rathfoot Roadside Park". ^ a b c Michigan State Highway Department & Rand McNally (June 1, 1936). Official Michigan Highway Map (Map). [c. 1:850,000]. Lansing: Michigan State Highway Department. §§ B1–B11. OCLC 12701143. ^ Google (July 1, 2008). "Negaunee, Michigan" (Map). Google Maps. Google. Retrieved July 1, 2008. ^ a b Michigan State Highway Department & Rand McNally (December 15, 1936). Official Michigan Highway Map (Map) (Winter ed.). [c. 1:850,000]. Lansing: Michigan State Highway Department. §§ B1–B11. OCLC 12701143, 317396365. Retrieved December 18, 2016 – via Archives of Michigan. ^ a b Michigan State Highway Department (April 15, 1953). Official Highway Map (Map). [c. 1:918,720]. Lansing: Michigan State Highway Department. §§ B1–B11. OCLC 12701120. ^ a b Michigan State Highway Department & Rand McNally (December 1, 1937). Official Michigan Highway Map (Map) (Winter ed.). [c. 1:850,000]. Lansing: Michigan State Highway Department. §§ B1–B11. OCLC 12701143. Retrieved December 18, 2016 – via Archives of Michigan. 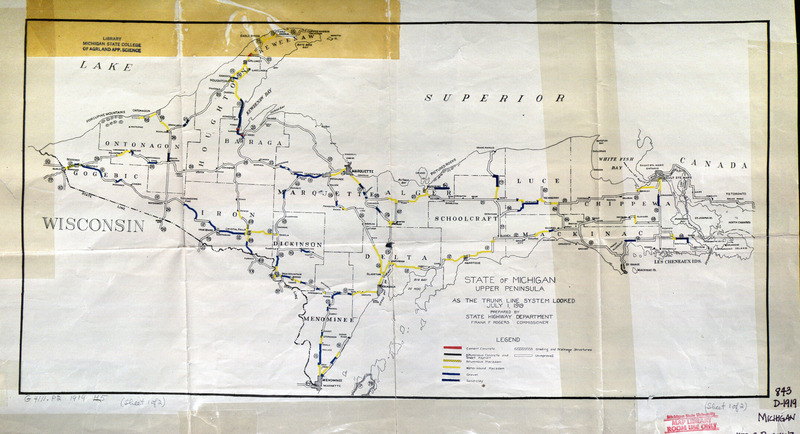 ^ a b Michigan State Highway Department & Rand McNally (March 21, 1941). Official Michigan Highway Map (Map) (Spring ed.). [c. 1:850,000]. Lansing: Michigan State Highway Department. §§ B1–B11. OCLC 12701143. ^ a b Michigan State Highway Department & Rand McNally (December 1, 1941). Official Michigan Highway Map (Map) (Winter ed.). [c. 1:850,000]. Lansing: Michigan State Highway Department. §§ B1–B11. OCLC 12701143. ^ Michigan State Highway Department & Rand McNally (June 1, 1942). Official Michigan Highway Map (Map) (Summer ed.). [c. 1:850,000]. Lansing: Michigan State Highway Department. §§ B1–B11. OCLC 12701143. ^ Michigan State Highway Department (July 1, 1948). Official Highway Map (Map). [c. 1:918,720]. Lansing: Michigan State Highway Department. §§ B1–B11. OCLC 12701120. Retrieved January 19, 2017 – via Archives of Michigan. ^ Michigan State Highway Department (April 15, 1950). Michigan Official Highway Map (Map). [c. 1:918,720]. Lansing: Michigan State Highway Department. §§ B1–B11. OCLC 12701120. ^ Michigan State Highway Department (April 15, 1952). Official Highway Map (Map). [c. 1:918,720]. Lansing: Michigan State Highway Department. §§ B1–B11. OCLC 12701120. Retrieved June 17, 2017 – via Archives of Michigan. ^ Google (March 16, 2008). "Wakefield, MI" (Map). Google Maps. Google. Retrieved March 16, 2008. ^ Michigan State Highway Department (1962). Official Highway Map (Map). [c. 1:918,720]. Lansing: Michigan State Highway Department. §§ B1–B11. OCLC 12701120, 173191490. Retrieved June 17, 2017 – via Archives of Michigan. ^ Michigan Department of Transportation. "Alger County" (PDF) (Map). Right-of-Way File Application. Scale not given. Michigan Department of Transportation. Sheet 56. OCLC 23853690. Retrieved May 8, 2008. ^ Michigan Department of Transportation (August 7, 1991). "Chippewa County" (PDF) (Map). Right-of-Way File Application. Scale not given. Michigan Department of Transportation. Title sheet. OCLC 12843824. Retrieved May 8, 2008. ^ Diem, Christopher (March 27, 2009). "City Set to Upgrade Confusing Intersection". The Mining Journal. Marquette, MI. ISSN 0898-4964. OCLC 9729223. Archived from the original on February 3, 2011. Retrieved April 2, 2009. ^ a b Diem, Christopher (April 1, 2009). "Residents Get Look at Plan for Roundabout". The Mining Journal. Marquette, MI. ISSN 0898-4964. OCLC 9729223. Retrieved April 2, 2009. ^ Diem, Christopher (June 21, 2010). "Roundabout Work Progresses". The Mining Journal. Marquette, MI. ISSN 0898-4964. OCLC 9729223. Archived from the original on February 3, 2011. Retrieved September 11, 2010. ^ Diem, Christopher (July 17, 2010). "Routes Through Town Reopen". The Mining Journal. Marquette, MI. ISSN 0898-4964. OCLC 9729223. Archived from the original on February 3, 2011. Retrieved September 11, 2010. ^ Diem, Christopher (August 6, 2010). "Open for Business: Motorists Take Measure of New Intersection". The Mining Journal. Marquette, MI. ISSN 0898-4964. OCLC 9729223. Archived from the original on February 3, 2011. Retrieved September 11, 2010. ^ Diem, Christopher (August 19, 2010). "New Roundabout Celebrated with Ceremony". The Mining Journal. Marquette, MI. ISSN 0898-4964. OCLC 9729223. Archived from the original on February 3, 2011. Retrieved September 11, 2010. ^ Michigan Department of Transportation (April 19, 2002). "M-28–Ontonagon River Bridge". Michigan's Historic Bridges. Michigan Department of Transportation. Retrieved January 28, 2008. ^ Michigan Department of Transportation (April 9, 2002). "Old M-28–Rock River Bridge". Michigan's Historic Bridges. Michigan Department of Transportation. Retrieved January 18, 2008. ^ National Park Service (1999). "National Register of Historic Places—Michigan (MI), Marquette County". National Register of Historic Places. Retrieved February 12, 2008. ^ Michigan Department of Transportation (April 23, 2002). "US 41–Peshekee River Bridge". Michigan's Historic Bridges. Michigan Department of Transportation. Retrieved January 18, 2008. ^ A. Lindberg & Sons, Inc. "Projects". A. Lindberg & Sons, Inc. Archived from the original on June 19, 2006. Retrieved February 13, 2008. ^ Michigan Department of Transportation (April 9, 2002). "M-28–Sand River Bridge". Michigan's Historic Bridges. Michigan Department of Transportation. Retrieved January 18, 2008. ^ a b Michigan Department of Transportation (April 15, 2002). "M-28–E. Br. Tahquamenon River Bridge". Michigan's Historic Bridges. Michigan Department of Transportation. Retrieved January 18, 2008. ^ a b c d e f Mackin, Pete (August 24, 2005). "CR 480 Plan Taking Shape". The Mining Journal. Marquette, MI. pp. A1+. ISSN 0898-4964. OCLC 9729223. ^ Michigan State Highway Department & Rand McNally (May 15, 1937). Official Michigan Highway Map (Map) (Summer ed.). [c. 1:850,000]. Lansing: Michigan State Highway Department. § B5. OCLC 12701143. Retrieved December 18, 2016 – via Archives of Michigan. ^ Michigan State Highway Department (1951). City of Ishpeming Act 51 Map (Map). Scale not given. Lansing: Michigan State Highway Department. ^ State Administrative Board (n.d.). "State Administrative Board Resolutions, 1940–Present" (PDF). State of Michigan. Retrieved February 13, 2008. ^ Michigan State Highway Department (1963). Official Highway Map (Map). [c. 1:918,720]. Lansing: Michigan State Highway Department. § B6. OCLC 12701120. Retrieved August 12, 2017 – via Archives of Michigan. ^ Michigan State Highway Department (1964). Official Highway Map (Map). [c. 1:918,720]. Lansing: Michigan State Highway Department. § B6. OCLC 12701120, 81213707. ^ Michigan Department of Transportation (1982). Say Yes to Michigan! : Official Transportation Map (Map). c. 1:190,080. Lansing: Michigan Department of Transportation. Marquette inset. OCLC 12701177, 320798736. ^ a b Swanson, Scott (April 26, 2005). "City to Get $2.5 Million". The Mining Journal. Marquette, MI. p. A1. ISSN 0898-4964. OCLC 9729223. ^ Michigan Department of Transportation (2006). Michigan, A State for All Seasons: Official Department of Transportation Map (Map). c. 1:975,000. Lansing: Michigan Department of Transportation. § B4. OCLC 42778335. ^ Michigan State Highway Department (October 1, 1952). Official Highway Map (Map). [c. 1:918,720]. Lansing: Michigan State Highway Department. §§ B1–B11. OCLC 12701120. Wikimedia Commons has media related to M-28.